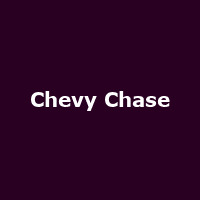 "One of the most honored and beloved actors of his generation, Chevy Chase first came to national prominence as a writer and performer with the original cast of NBC's 'Saturday Night Live,' for which he won two Emmy Awards. Soon after endearing himself to television audiences, Hollywood beckoned and Chevy made his feature film debut in the comedy-thriller 'Foul Play' with Goldie Hawn. His many memorable films include: 'Caddy Shack' 'Seems Like Old Times' 'National Lampoon's Vacation' 'Fletch' 'National Lampoon's European Vacation' 'Spies Like Us' 'The Three Amigos' 'Funny Farm' Caddyshack II' 'Fletch Lives' 'National Lampoon's Christmas Vacation' 'Memoirs of an Invisible Man' Cops and Robbersons' 'Man of the House' 'Vegas Vacation' and 'Snow Day.'"